Description: A patched Southern Pacific AC4400CW trails a Norfolk Southern Dash 9 and an ex-Conrail SD60M on a westbound train at Leetsdale. Description: NS W35 sits on the NS CofGA main as the East bound NS 334 passes in the siding. Description: Another shot of a northbound roadrailer train....very uniform looking, wouldn't you say? Description: D9-40CWs 9229 & 9363 lead a mixed freight through Horseshoe Curve. Description: With three and brush cutting done, you get this view of the western leg of the curve. 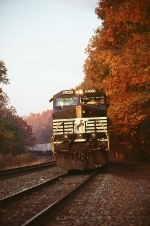 Description: NS 20K, a hot Chicago-Croxton premium intermodal train, awaits the passage of NS 21M just after sunrise on a chilly November 5, 2006. 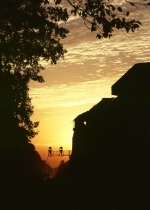 Description: The dawn light of November 5, 2006 illuminates NS 20K as it pauses to wait for 21M at the east end of Pattenburg Siding. The colors of the season are peaked as the cool morning mist burns away.